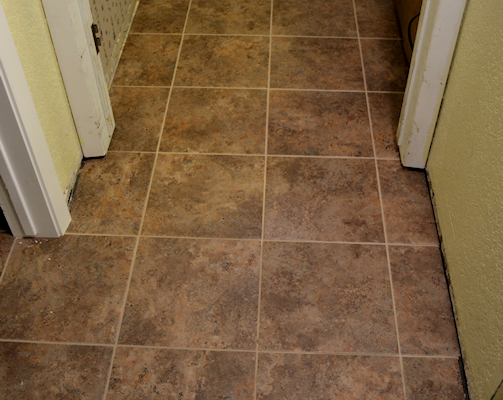 My bathroom makeover is moving right along. This weekend, I got some shelves made and installed over the toilet (which I’ll share with you later), and I got some artwork done for my one blank wall. 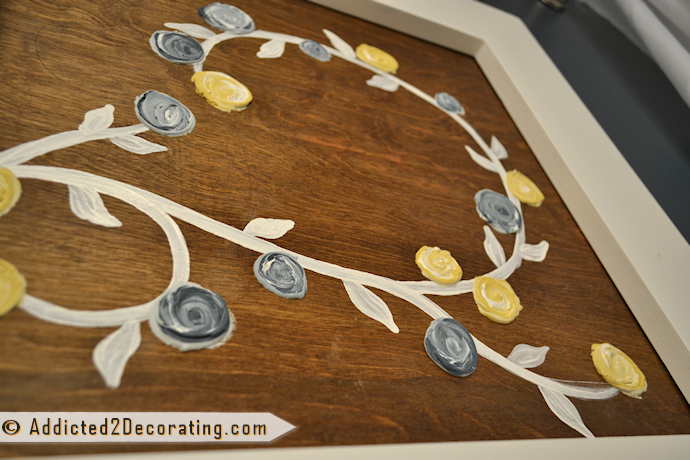 I wanted something simple, and something that incorporated all of the colors in the bathroom (including the stained wood), so I recycled the big white chunky frames from this project, and created this flower vine artwork with dimensional flowers made with drywall mud. I didn’t take any step-by-step pictures, because it’s really pretty straightforward. I started by cutting two pieces of plywood, and then staining them for the “canvas”. 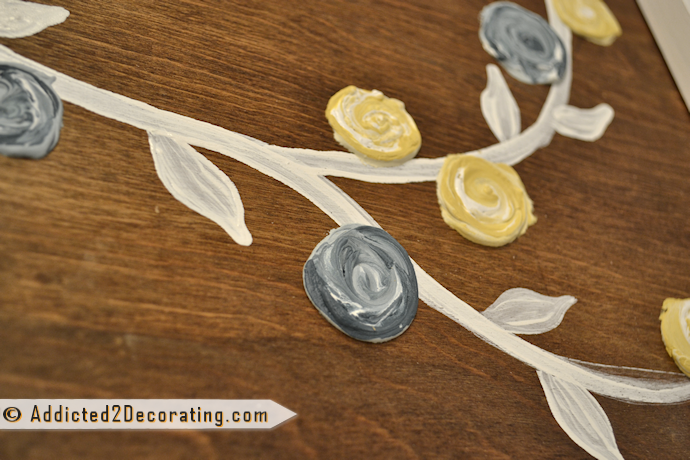 Then I drew a vine onto the plywood with pencil, and went over it with white paint using a craft brush. Then I added a few leaves to the vine. 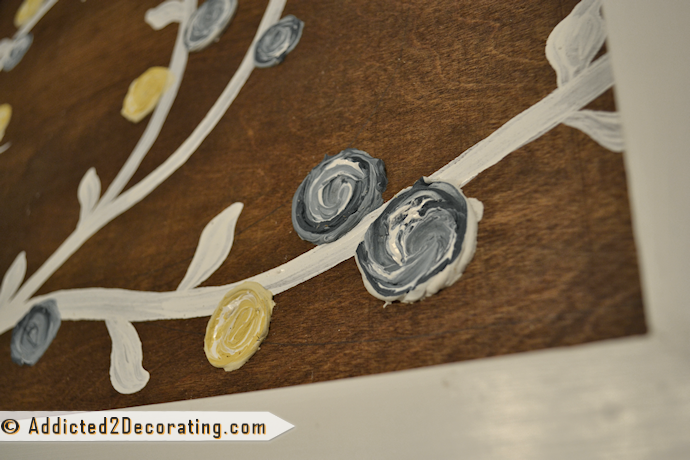 To make the flowers, I mixed a little bit of paint with pre-mixed drywall mud, just enough to make it workable. (The pre-mixed stuff is a little on the dry side.) Then I scooped up some of the drywall mud with my brush, put it on the plywood, and then used my brush to swirl it around. Then I dipped my brush into the paint (either the teal or the yellow), and swirled the paint into the drywall mud. Then I repeated that with white paint. Just dip and swirl. I didn’t swirl too much because I didn’t want the colors to mix too much. I think this artwork attempt goes in my “it’ll do” category. I love the flowers, but I’m not too thrilled with my vine. The only craft brush I could find was too big for vine-making, so it ended up being too thick for my taste, instead of thin and wispy like I envisioned it. Love it! I think the vine looks great, especially against the dark stain. I absolutely love those little flowers and the technique! I would never have thought to do that. Your flower vine artwork is divine! 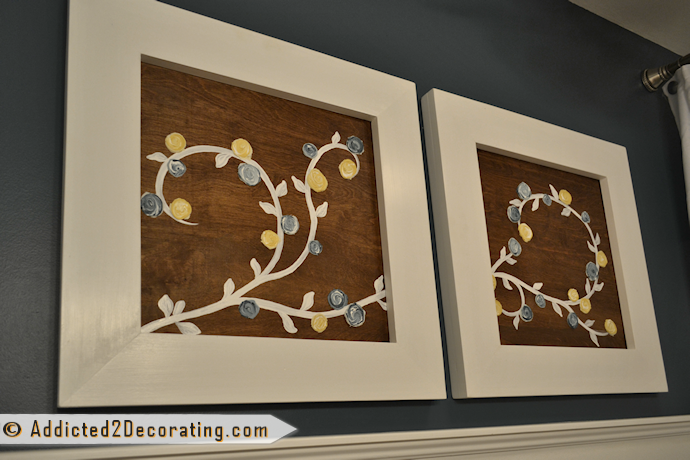 Such a clever idea to use drywall mud as paint. I would have never thought of that. Thanks for sharing! It is important to remember that there is a person and a story behind Pinterest posts even if they just seem like imperonal pictures floating around the web. P.S. Is that a bit of shower curtain that I see in the picture? Can’t wait to see it!! Haha! I actually meant to mention that. Unfortunately, it’s just the shower curtain liner. The shower curtain is still on the “to do” list. I love the 3D look that the dry wall mud gave to your flowers. It definitely added that unique touch. P.S. 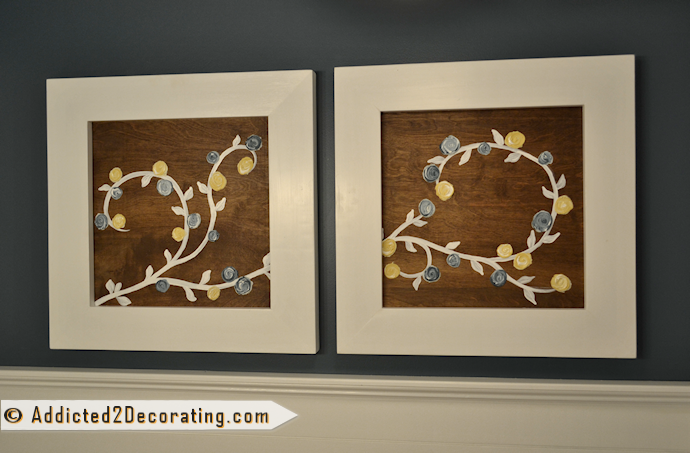 I love the contrast of the dark stained wood panel background and the white frame! Yours is way better than the pinterest one. WAY better. Love it. Oh my goodness!! How stinking cute are those!! Love it!! I love your artwork. I like the one on Etsy, too, but you want yours to be unique, not like the one on Etsy. Looks great! You are probably your own worst critic. Can’t wait to see your shelves and see what you decided to do for a shower curtain. You go, Girl! I like it! Looks fresh and the colors are perfect to bring everything together. Well done. Hey Kristi, that is truely customized and lovely. It reminds me that I once saw an idea that used tinted drywall mud with a stencil. Both are cute but yours is better in my opinion. I agree, I love yours better too. Sounds like you could make a bundle by selling these. I love this and can’t wait to see what you decide to do for the curtain! Hi Kristi, thanks so much for posting a link to my artwork! I am so flattered that you like it(although it seems like your blog readers appreciate yours quite a bit more and aren’t afraid to say it)! Your textured paintings are lovely and your blog is terrific too. I love to paint, but I’m not very ambitious with interior decorating (I wish I was). Your blog is truly inspirational! Enjoy your week. I LOVE your artwork! I love the vine, it’s so whimsical and flow-y (is that a word?) and I adore the dimensional flowers. The Etsy painting is sweet, too, but I really really like yours with the vine, and how the paintings together form a diptyche. I also saw your shelf project, and must say I am duly impressed with what you have done with this bathroom, the transformation is nothing short of amazing! Maybe you can do a small painting like the Etsy one to place on your top shelf? I had wanted to do this around my ceiling fan (like a faux medallion). Seemed a little scary to me, but you made it look easy! 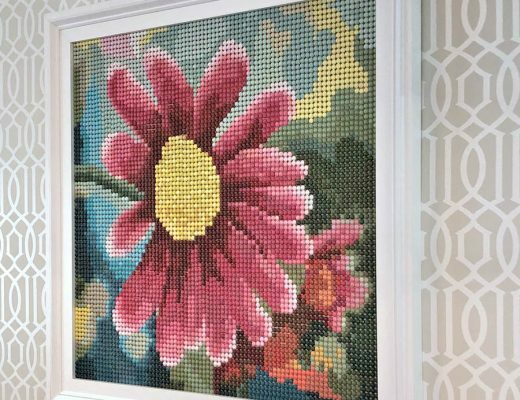 It doesn’t always require a very large budget to put something really creative on the wall. If you have the ability to get creative you can find yourself with a nice conversation piece. You just have to put your thinking cap on. I too, like yours much better than the other one. It caught my eye right away. 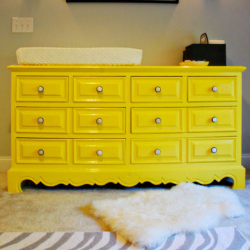 It’s simple and sweet and gives your eye room to rest within the picture. I like the vine. The whole thing strikes me as light, refreshing and a bit whimsical.